Yesterday whilst I was out, I was on the hunt for something of a lacquered nature that would razzle dazzle me. I keep seeing the same polishes again and again and as my stash is pretty manageable (I counted today and had 104 bottles) I'm pretty much aware of everything that I have...and don't need more than one of the same colour unless it's a brilliant one. Brown is one colour I no longer had, so I picked up one by Maybelline. What can I say about it? Well, it's brown and does what it says on the bottle! The consistency was a little runny BUT I was able to get away with only two coats and I'm usually a three-coater kind of gal. Chocolate, yes. But where's the frost?? Hot chocolate more like. Flash - NOT a true representation of the colour but it does look like it's edible! I got bored with the colour after a couple of hours and decided to add an image from Bundle Monster (BM) plate 21. I used Gold Digger by Models Own (it worked a treat with the stamping). I had to double stamp because the images were a little too small. You can probably tell mainly from the middle finger nail. You may also notice a different watermark too. What do you think? Which is better? I'm still on the fence because I'm not totally fond of the one I've been using so far. On that note, I'll love you and leave you. 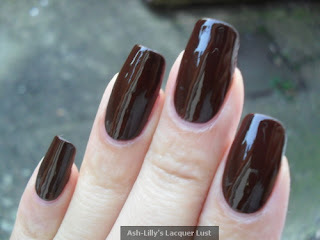 Very pretty, i like wearing brown in the winter months. Great stamping. I don't know why I become so lazy to use my stamping kit. I like your pink watermark so much better. What program are you using to crop and watermark? How come the comments came out like this? I'm confused!